Since Steve and I are in our mid-20s, it's about time we moved back in with our parents, right? Luckily this move-in is just for the business, not for us and our two rambunctious dogs. 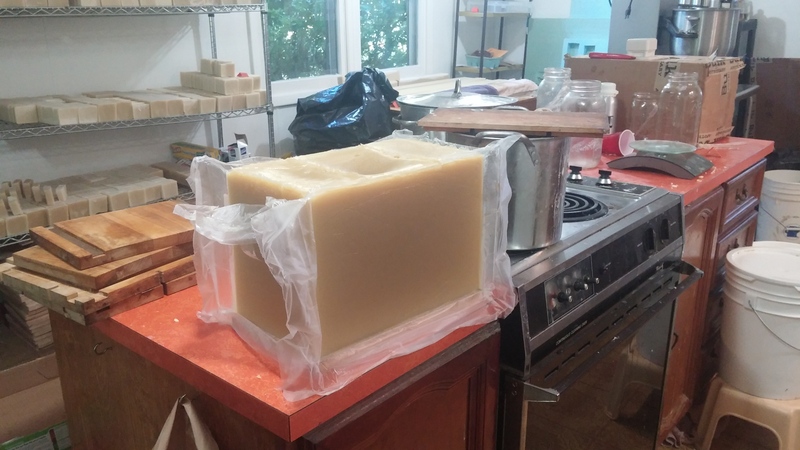 When we started making soap, we were living in a huge old house that we had been running as a Bed & Breakfast. We quickly quit the B&B as the soap took over the kitchen, dining room, living room, and what was supposed to be our bedroom. From there we moved our soap operation over to our new house that Steve is renovating. The house is an old farmhouse (1879) with a kitchen & screened-in-porch addition that didn't need quite as much work as the rest of the house (or so we thought). That beautiful white plastic wrap is where our new shop will be (the other side of the addition is the soap making room). Steve's going to put up cedar board & batten siding to contrast with the beautiful old clapboards! Unfortunately after Steve finished renovations on the screened-in-porch (turning it into a future store and storage room) we decided the soap room, as we call it, really needed to be reconfigured, insulated, and have new windows put in like the rest of the house. So at the moment my soap room at my new house has no walls, no sink, and about half a floor. Ideal soap making conditions. Which brings me to my parents' basement. Steve and I are very lucky to live so closely to our families. My parents' house is 2 miles away from our apartment (where we're living while we renovate the house) and just happens to have a big, dry, semi-empty basement. I was also very lucky to be out of town when the Great Soap Move took place, because I am not a Stair Master. The best thing about the basement is that it's got lots of space. I have a messy room where I splash soap on the floor and get oils on the carpet, and a dry room where I can stack lots and lots of bars of soap. But I'm still looking forward to being in my new space, and most of all to living right next to where I work!